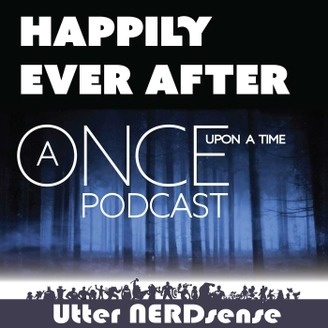 Here at Happily Ever After we are recapping each weeks episode of Once Upon a Time. It's all about Belle and Rumple on "The Changelings", episode nine of Once Upon a Time Season 6. Belle's pregnancy ends sooner than expected with manipulation from both Rumple and the Evil Queen. And we finally meet The Black Fairy, who also happens to be the mother of a spinning wheel loving dark one. Check out the podcast below and show notes after the jump We love to hear from you. Join the discussion on our Facebook group https://www.facebook.com/groups/utternerdsense/ You can leave us e-mail feedback through feedback@utternerdsense.com You can find all our shows at http://utternerdsense.com/ Follow us on twitter Updates: @utternerdsense (https://twitter.com/utternerdsense). Jay: @dreamjae (https://twitter.com/dreamjae) Matt @emmafrost8 (https://twitter.com/emmafrost8) Help us out! If you enjoyed the show, you can really help us by subscribing and giving us a rate and review on iTunes. You can find our Once Upon a Time podcast at our iTunes feed https://itunes.apple.com/us/podcast/happily-ever-after-once-upon/id981785085?mt=2 You can also find our Marvel’s Agents of SHIELD podcast on iTunes at https://itunes.apple.com/us/podcast/agents-steranko-agents-shield/id981784888?mt=2 You can also check out our UtterNerdsense Network feed that includes Once Upon a Time as well as our other podcasts, such as Agents of Shield, at https://itunes.apple.com/us/podcast/utter-nerdsense/id955625598?mt=2 Once Upon a Time stars Ginnifer Goodwin as Snow White/Mary Margaret, Jennifer Morrison as Emma Swan, Lana Parrilla as the Evil Queen/Regina, Josh Dallas as Prince Charming/David, Emilie de Ravin as Belle, Colin O’Donoghue as Hook, Jared S. Gilmore as Henry Mills, Sean Maguire as Robin Hood, Rebecca Mader as the Wicked Witch/Zelena and Robert Carlyle as Rumplestiltskin/Mr. Gold. Season 6 of Once Upon a Time airs Sundays 8/9c on ABC.